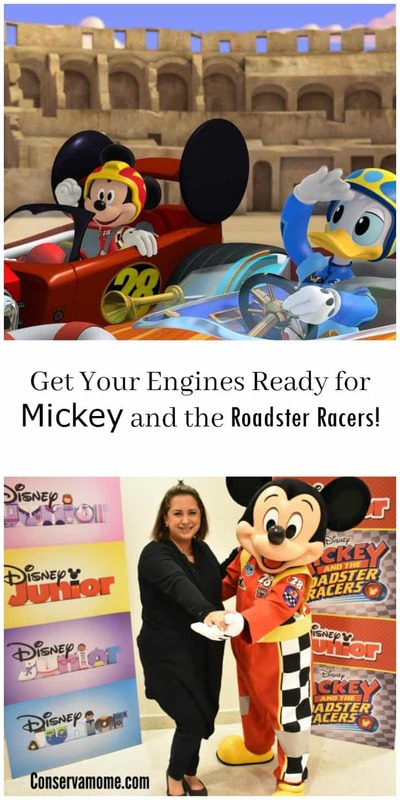 Get Your Engines Ready for Mickey and the Roadster Racers! 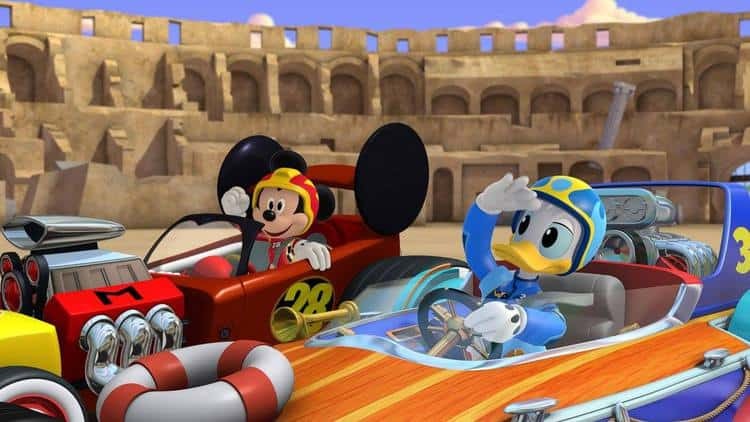 My Boys are SOOO excited about a new show Making it’s debut this Sunday January 15 at 9am EST called Mickey and the Roadster Racers. This show is going to be fantastic. How do I know? Because I had a chance to preview the first episode last month on my trip to San Francisco. I also had the chance to sit down and talk about the show with creators MARK SEIDENBERG & ROB LADUCA. These guys are no newbies! They have worked on some pretty amazing shows including Jake And the Never land pirates and the 80’s cartoon I grew up with Gummie Bears! They talked about aspects of the show and what will make it such a hit with kids. Funny enough, my 4 year old has been playing the previews on demand over and over because of how excited he is, so I know this show is going to be pure awesomeness. 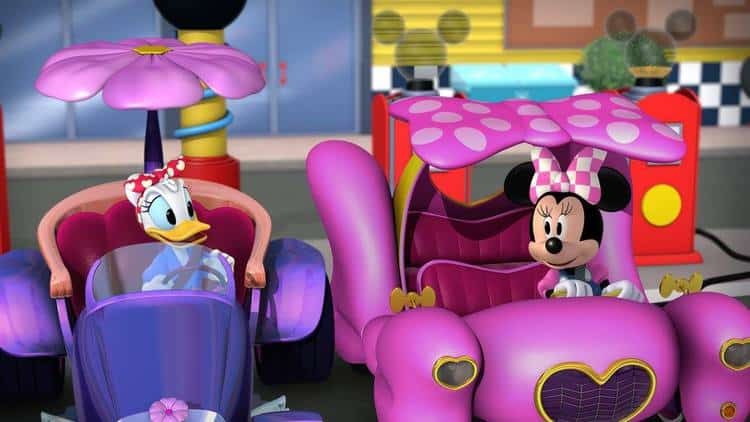 I mean think about it, you’re combining Mickey,Cars and Fun! What more can a toddler-preschooler ask for! 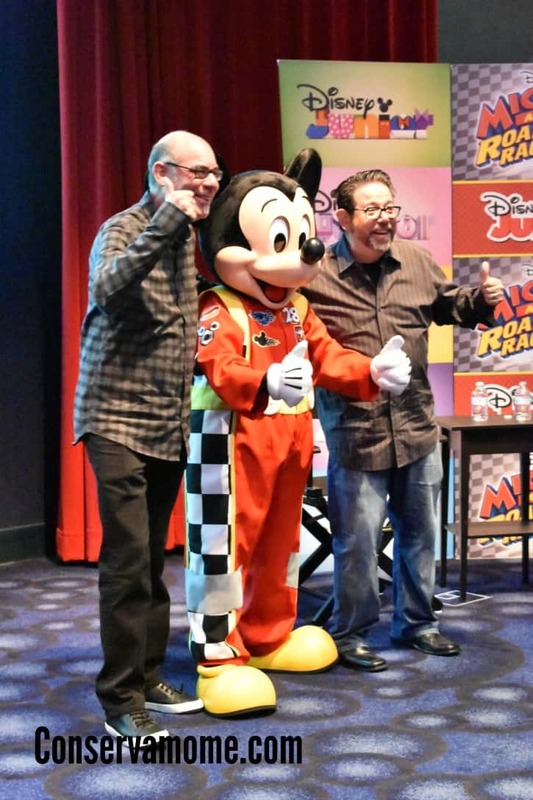 The series, which will premiere internationally throughout 2017, takes Mickey and the gang, along with their unique transforming vehicles, on humorous high-spirited races around the globe, as well as hometown capers in Hot Dog Hills. You may remember Hot Dog Hills from the Mickey Mouse Club House show. 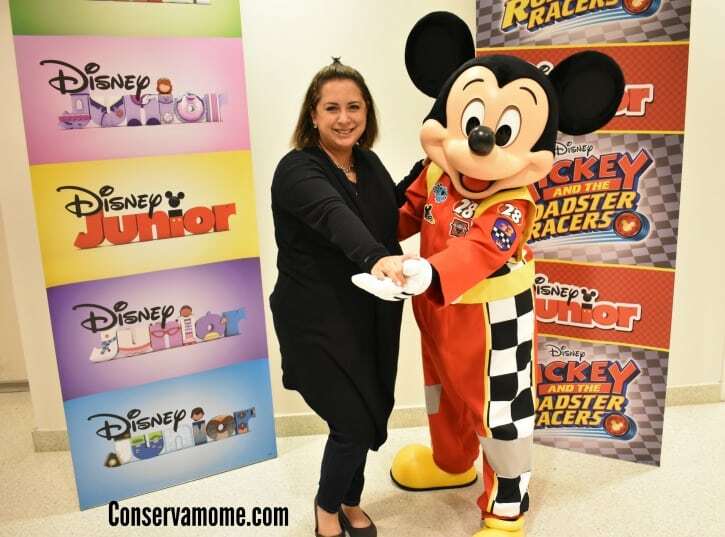 Off the racetrack, Minnie and Daisy also run their own successful business as Happy Helpers, solving problems for anyone in need of a helping hand. Geared towards kids 2-7, the stories are designed to impart social and emotional lessons about friendship, teamwork, optimism and good sportsmanship. It helps piggy back off of the lessons kids have been learning on Mickey Mouse Club House. Add some humor, fast paced action and some star studded power ,you heard right! 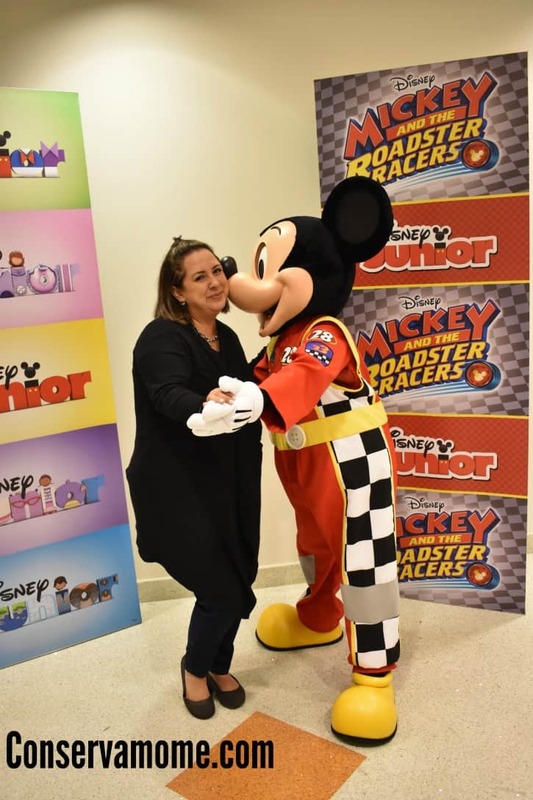 And No I’m not just talking about the Star of the Show Mickey! 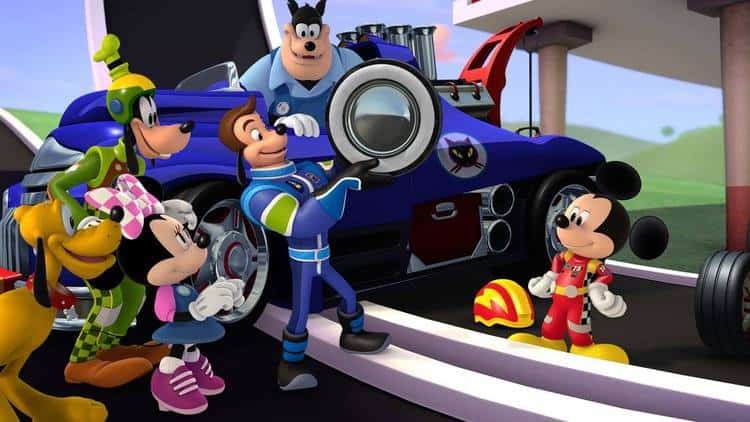 There will be some Famous voices you’ll hear in the episodes,some that will be regulars like: NASCAR stars Jimmie Johnson, Danica Patrick and Jeff Gordon recur as race car drivers Jiminy Johnson, Danni Sue and Gordon Gear, respectively. Additional guest stars include television personality Jay Leno as announcer Billy Beagle; Tim Gunn (“Project Runway”) as Robbie Roberts; Gordon Ramsay (“MasterChef”) as Chef Oxley; Hoda Kotb (“The Today Show”) as Mrs. Sweetums; Peter Serafinowicz (“Guardians of the Galaxy”) as Dr. Crutchley; Jane Leeves (“Frasier”) as the Queen of England; Fred Willard (“Best in Show”) as Mr. Doozy; Hector Elizondo (“Last Man Standing”) as Grandpa Beagle; Tony Shalhoub (“Monk”) as Luigi; Kate Micucci (“Garfunkel and Oates”) as Emmy Lou. and this show will take TV by Storm. I’m serious folks, this show is going to be the next best thing! Best of all, the story line is going to be so much fun even parents will have no issues sitting down and watching it with their kids. Which is a huge plus in my books. It’s no wonder through, After meeting the creators I can tell why they are so good at what they do. 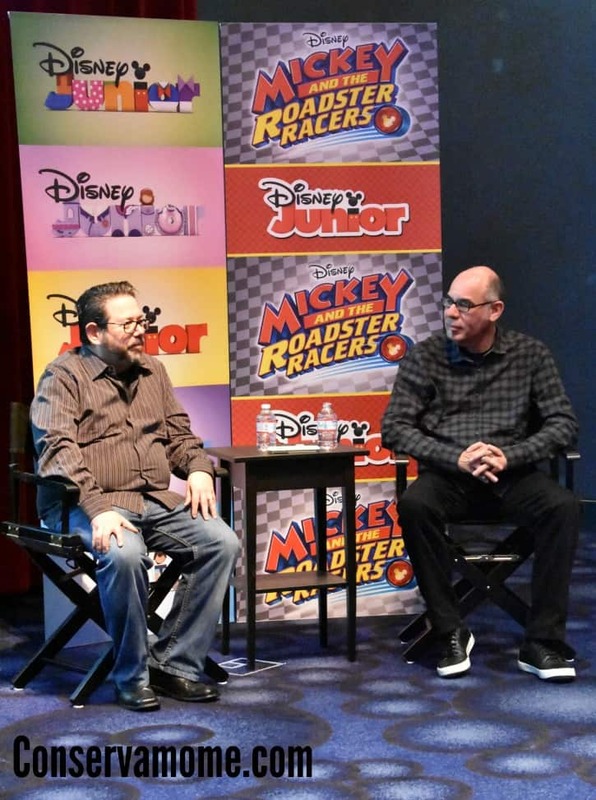 The concept of the show originated when Marc and Rob asked, What was the most popular episode of Mikey Mouse Club house and the answer was an overwhelming ” Road Rally”. So by grabbing successful elements of MMC and bringing together a fun high paced show like this, they are continuing the story for kids and families. A fun fact about these guys was that they both worked on the Cartoon Gummie Bears. Yup, the show many of you remember as kids. So it was fun asking them how things had changed since they worked on the show and they agreed it was the technology. They’re able to do more things in less time and work on projects in more detail without all the work. For example in this show they have the basic car models they pull from to use on the various episodes and are able to work with each one. Using them as guides and being able to input them for the cars they need in each episode. 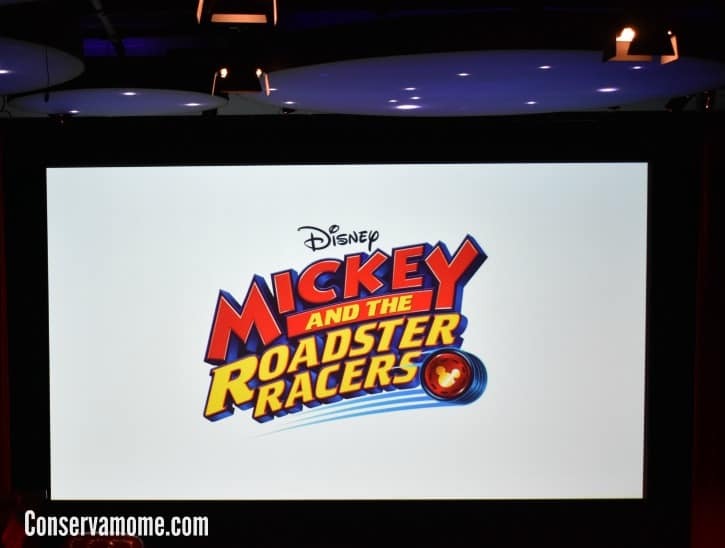 Mickey and the Road Racers will broaden the world of Hot dog hills. You won’t just see all the green pastures you’re use to in the MMCH show. Now you’ll be able to experience the world as Mickey and the gang see it. From lots of various characters to landscape you didn’t know existed there. Best of all it will touch on so many lessons. We’ll see stories like when Donald needs to deal with his temper,and he has to learn to calm down. 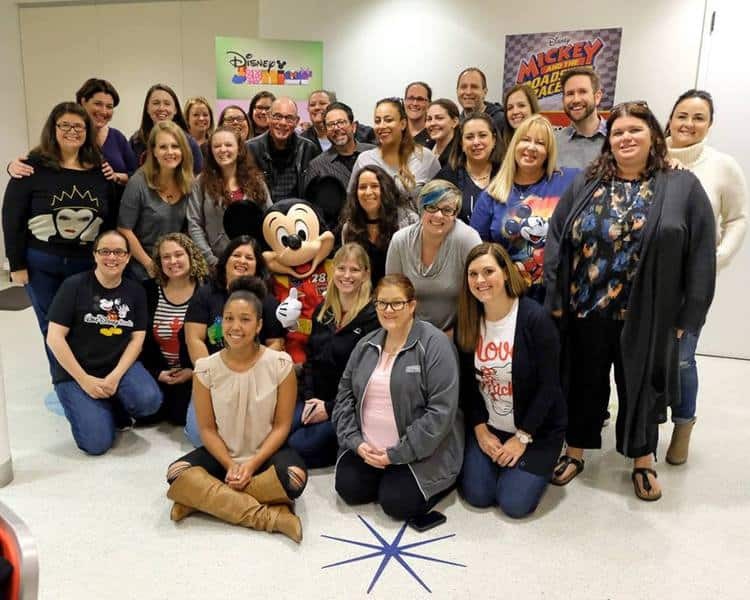 There will be an episode called Guru Goofy. And Goofy teaches Donald to just slow down. And think about what you’re doing before you go off the handle. They’re themes that all kids can relate to. It was such a treat to check this first episode out before anyone else, but most important it was even funner to do it with the creators. I can’t wait until this show hits the air and my kids get to experience it themselves. Not only was the preview and interview a fantastic treat but I also had a chance to meet the star of the show. By far one of my favorite interviews of all time . Need a little more Mickey and the Road Racer fix before the big debut Sunday? Check out this Featurette made exclusively for us as part of our Press trip. Find out more of the details about the show and how amazing it’s going to be! *Unless other wise noted, pictures courtesy of Disney Junior /David Moir.